Another year is upon us, meaning there will be many lovely new watches for us to look at and hopefully review. First in the annual watch event calendar is the SIHH 2015 Watch Salon which takes place in Geneva. In fact as I write this it starts tomorrow (Monday January 19th). Having sifted through all of the previews that I have managed to get my hands on, in this article I will be showing you my favourites from the Richemont stables. Some will be classic, some crazy and some downright unthinkable. So now the manual wind version of the Saxonia is as small as 35mm which in modern watch terms is pretty rare. Your average wrist borne timepiece now measures a ‘large’ 40mm. As you can guess this piece is definitely one for the understated and also the dressier wearer. The automatic model is still a pretty much perfect 38.5mm, it is here where you will really see the differences in the dial. Look a little closer and you might just be able to spot the minor differences. There is no longer an outer ring that links the minute markers together, nor are there any hour dots in line with the baton hour markers. Last but not least is the Saxonia Dual Time which has gone through a slight size change, from the previous 40mm to now the smaller 38.5mm. Incidentally it is now the same size as the standard automatic Saxonia. Not exactly revolutionary, but allows for a greater brand identity with cleaner and unfussy look. I really like these new Saxonia models, my favourite being the dual time as it gives a greater balance than the other two. 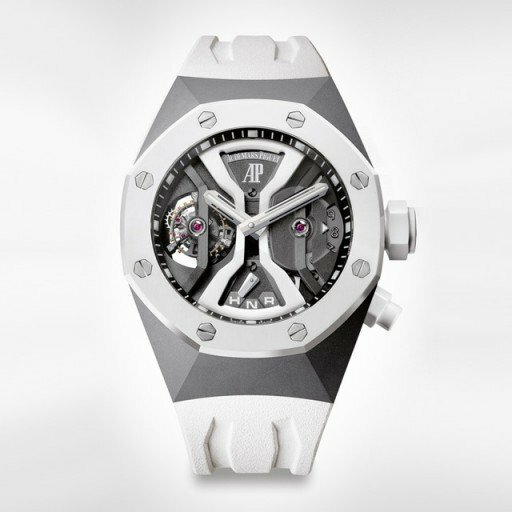 Next up the futuristic looking Audemars Piguet Royal Oak Research Concept Watch, yes it is definitely a mouthful. I feel rather sorry for the guys and girls who have to present this piece during the whole week of SIHH, The aesthetics are very similar to last year’s concept watch, and a few others down the line also. This time rather than just tackling the accuracy of time and the materials used, AP have decided to tackle the problem of some minute repeaters being too quiet. I did not know that it was a big problem, but hey like most concepts (be it cars, planes, boats, hell even a watch) it can be outlandish and not necessarily require a need. A partly opened worked dial reveals lots of stunning finishing, an odd looking ‘dial’ that seems to have a counter for a chronograph on the right, and some apertures on the left at the 9 o’clock position. I am uncertain as to what this plate or structure has to do with the increasing of volume for the minute repeater. Either way it does give what there is of the dial, a nice balance between the two sides. Again very similar to the overall look of last years concept. Measuring in at 44mm and completely in titanium, will mean that this piece is relatively light and have a good presence on one’s wrist. And below is last year’s Concept GMT Tourbillon, you can clearly see the design language between the two pieces. It will be interesting to see this piece in action and also to see what sort of volume of noise it makes. Hopefully in the not too distant future we will be able to get our hands on one to see what it is like. In the next part we will look at what is available from Cartier, IWC and Jaeger-LeCoultre.